The best treatment strategy for a patient with type 2 diabetes who shows pronounced weight gain after the introduction of insulin treatment is unclear. We determined whether addition of a glucagon-like peptide-1 (GLP-1) analogue could reverse pronounced insulin-associated weight gain while maintaining glycaemic control, and compared this with the most practised strategy, continuation and intensification of standard insulin therapy. In a 26-week, randomised controlled trial (ELEGANT), conducted in the outpatient departments of one academic and one large non-academic teaching hospital in the Netherlands, adult patients with type 2 diabetes with ≥4% weight gain during short-term (≤16 months) insulin therapy received either open-label addition of liraglutide 1.8 mg/day (n = 26) or continued standard therapy (n = 24). A computer-generated random number list was used to allocate treatments. Participants were evaluated every 4–6 weeks for weight, glycaemic control and adverse events. The primary endpoint was between-group weight difference after 26 weeks of treatment (intention to treat). Of 50 randomised patients (mean age 58 years, BMI 33 kg/m2, HbA1c 7.4% [57 mmol/mol]), 47 (94%) completed the study; all patients were analysed. Body weight decreased by 4.5 kg with liraglutide and increased by 0.9 kg with standard therapy (mean difference −5.2 kg [95% CI −6.7, −3.6 kg]; p < 0.001). The respective changes in HbA1c were −0.77% (−8.4 mmol/mol) and +0.01% (+0.1 mmol/mol) (difference −0.74% [−8.1 mmol/mol]) ([95% CI −1.08%, −0.41%] [−11.8, −4.5 mmol/mol]; p < 0.001); respective changes in insulin dose were −29 U/day and +5 U/day (difference −33 U/day [95% CI −41, −25 U/day]; p < 0.001). In five patients (19%), insulin could be completely discontinued. Liraglutide was well tolerated; no severe adverse events or severe hypoglycaemia occurred. In patients with pronounced insulin-associated weight gain, addition of liraglutide to their treatment regimen reverses weight, decreases insulin dose and improves glycaemic control, and hence seems a valuable therapeutic option compared with continuation of standard insulin treatment. Funding The study was funded by Novo Nordisk. The introduction of insulin therapy is common practice when oral glucose-lowering agents fail to maintain glucose control in patients with type 2 diabetes [1, 2]. Insulin is safe and efficacious in improving glycaemic control, thereby reducing micro- and possibly macro-vascular complications [3, 4], but it may induce weight gain. This weight gain shows large interindividual differences, with some patients showing no or only minor weight gain and others even losing weight . In a substantial group of patients, however, weight gain is more pronounced (≥4–5%). This is obviously undesirable in an already overweight population, and it may lead to aversion to the therapy and a further increase in insulin dose, and offset the beneficial effects of insulin . Most insulin-induced weight gain, on average 2–6 kg, occurs within the first 9–12 months of insulin therapy [5, 7, 8]. Hence, a therapy that ameliorates pronounced weight gain when encountered within this time frame would be extremely desirable, but the best treatment strategy for this clinical problem is unclear. Glucagon-like peptide-1 (GLP-1) analogues stimulate insulin secretion, suppress glucagon release, and reduce food intake, resulting in improved glycaemic control and weight loss in type 2 diabetes [9, 10, 11, 12, 13, 14, 15]. Addition of GLP-1 analogues to insulin therapy may thus be beneficial in reversing pronounced insulin-induced weight gain. However, GLP-1 analogues are expensive, have gastrointestinal side effects, and lack long-term safety and efficacy data, which renders it important to select those patients that are most likely to benefit from this therapy. Previous studies on the combination of GLP-1 analogues and insulin all focused on glycaemic benefit, with some reporting additional weight loss and others stable body weight [16, 17, 18, 19, 20, 21, 22, 23, 24, 25, 26, 27, 28, 29, 30, 31]. Furthermore, most studies are either placebo controlled or observational and do not compare clinically relevant treatment strategies. We hypothesised that addition of a GLP-1 analogue to insulin therapy may reverse pronounced insulin-induced weight gain while maintaining glycaemic control, in comparison with the standard approach, i.e. continuation and intensification of insulin. This hypothesis was tested by the Effect of Liraglutide on Insulin-associated Weight Gain in Patients with Type 2 Diabetes (ELEGANT) trial. This 26-week open-label, randomised, controlled clinical trial was conducted in the Radboud University Medical Centre and one affiliated large non-academic teaching hospital (Jeroen Bosch Hospital, ‘s-Hertogenbosch, the Netherlands) between February 2012 and October 2013. The trial was approved by the institutional review board (IRB) of the Radboud University Medical Centre and conducted according to Good Clinical Practices and the Declaration of Helsinki. All participants provided written informed consent and received reimbursement of travel costs. Potentially eligible individuals with type 2 diabetes were selected from the outpatient departments of the two participating hospitals, recruited by advertisement, or enrolled by their diabetes nurse or general practitioner. They were men or women aged 18–75 years, with a BMI of ≥25 kg/m2 and HbA1c of ≥6.5 and ≤8.5% (≥48 and ≤69 mmol/mol), who had recently started insulin therapy (≥3 and ≤16 months), with concomitant documented weight gain of ≥4% body weight since initiation of insulin treatment. All types and regimens of insulin were allowed. Exclusion criteria were recurrent hypoglycaemia, diabetic gastroparesis, use of oral glucose-lowering agents or drugs known to interfere with blood glucose levels other than sulfonylurea or metformin, recent start of diuretics, heart failure (left ventricular ejection fraction of <30%), inflammatory bowel disease, a recent history of pancreatitis, uncontrolled thyroid disease, liver enzymes ≥3.0 times upper normal limit, plasma creatinine >130 μmol/l, and pregnancy. The initial protocol was amended twice: the duration of insulin treatment was changed from ≤12 to ≤16 months because it turned out that weight change was notified later than expected resulting in delayed inclusion in the trial, and the number of participants was decreased as the weight-reducing effect of liraglutide was greater than anticipated. Both amendments were submitted to and approved by the IRB. Participants who met the screening criteria were randomised (1:1), using a computer-generated random number list, to open-label treatment with liraglutide (Novo Nordisk, Bagsvaerd, Denmark) 1.8 mg once daily or standard therapy (continuation and intensification of insulin therapy without liraglutide). Participants were randomised in blocks of four according to body weight (≤100 kg or >100 kg). After enrolment, all participants continued their usual diet and exercise regimens as well as insulin therapy and oral glucose-lowering agents (sulfonylurea and metformin). None of the patients received a dietary consultation; also, no additional nutritional recommendations were made. In patients randomised to liraglutide, total insulin dose was decreased by 20% to avoid hypoglycaemia. Liraglutide was injected subcutaneously into the thigh or abdomen and administered at any (consistent) time of day. It was initiated in 0.6 mg/day weekly increments to a final 1.8 mg/day dose. When adverse events occurred, participants were allowed to return to the 1.2 mg dose. For safety reasons, participants were instructed to perform daily self-measured capillary blood glucose profiles during the first 3 weeks after the start of liraglutide, and insulin dose was adjusted weekly by telephone consultation. For both treatment groups, follow-up visits were scheduled at 4, 8, 12, 16, 20 and 26 weeks. During every visit, participants were asked to report adverse events, body weight was measured on a calibrated scale (with the participant in light underwear), blood pressure was measured, and insulin dose was adjusted using a specific algorithm (adapted from the Wolverhampton protocol) . According to this protocol, insulin dose was adjusted with −2 to +6 U per injection, aiming at fasting glucose levels of 4.0–6.5 mmol/l, and premeal (or postprandial) values of ≤8.0 mmol/l. HbA1c was determined every 8 weeks using an HPLC method. At baseline and end of follow-up, blood was drawn for determination of fasting blood glucose, HbA1c, full blood cell count, thyroid function, liver enzymes and serum creatinine. Measurements of all variables were performed in the national accredited clinical laboratory units of the two participating hospitals, according to standard procedures. Also, at baseline and at 26 weeks, quality-of-life questionnaires on diabetes-related distress (Problem Areas in Diabetes Scale [PAID])  and depression (Beckman Depression Inventory II [BDI-II])  were administered, and waist and hip circumference were measured. Physical activity including energy expenditure and average metabolic equivalent (METS; 1 MET equals consumption of 4 kJ [1 kcal]/kg of body weight per hour) was measured quantitatively at baseline and at 26 weeks via a portable armband (HealthWear Bodymedia, Pittsburgh, Pennsylvania, USA)  for four consecutive days. The armband was worn around the upper right arm and was removed only for showering and bathing purposes. It had to be worn at least 90% of time to be included for analysis. The primary efficacy endpoint was the change in body weight between the two treatment groups from baseline to week 26. Secondary endpoints included change in HbA1c, insulin dose, physical activity and quality of life, and number of patients discontinuing insulin. Safety assessments included adverse events and number and severity of hypoglycaemic episodes. Hypoglycaemia (<3.9 mmol/l) was graded asymptomatic or mild (grade 1), moderate (requiring additional oral carbohydrate; grade 2) and severe (requiring third-party assistance, irrespective of glucose levels; grade 3). All statistical analyses were performed according to intention-to-treat, using IBM SPSS version 20.0 (Chicago, Illinois, USA). p < 0.05 was considered significant. Descriptive characteristics are expressed as mean ± SD; results are expressed as mean ± SEM, unless otherwise indicated. With 50 randomised participants and a dropout rate of <20%, 21 participants per treatment arm would provide an 80% power to detect a clinically relevant treatment difference of 4% (4.0 kg) in the absolute change in body weight from baseline to week 26. This assumed an SD of 4.6 kg with a two-sided 5% significance level. A linear mixed model for repeated measures was used to estimate the effect of treatment on weight, HbA1c and insulin dose at multiple time points with fixed effects for treatment, visit, treatment-by-visit interaction, baseline weight stratum, baseline of the variable analysed and centre. Treatment differences are summarised by maximum likelihood means and 95% CIs from the mixed model. Missing values were not imputed. Independent two-tailed t tests (or Mann–Whitney U tests for non-parametric data) were performed to assess between-group differences in all other secondary endpoints, baseline continuous variables and hypoglycaemia rates. The Fisher exact test or χ 2 test was used as appropriate for analysis of between-group differences in categorical variables. Multiple linear regression analysis was used to assess factors at baseline and at follow-up associated with weight loss after 26 weeks of liraglutide treatment. Variables included in linear regression analysis were selected using the backward stepwise method. A variable stayed in the model if it had a p value of <0.05. A total of 64 potentially eligible participants underwent screening. Fifty were randomised and assigned to liraglutide or standard therapy (Fig. 1). Three participants (6%) dropped out prematurely: two in the standard therapy group withdrew consent after 1 and 10 weeks of follow-up, respectively; one patient randomised to liraglutide stopped after 4 weeks of treatment because of exaggeration of acne, which could not be objectified by the research staff and was judged to be unrelated to study medication. Baseline characteristics of the two groups were similar and are presented in Table 1. Participants in this trial were generally middle-aged and overweight (mean BMI of 33 kg/m2), with fair glucose regulation (mean HbA1c 7.4% [57 mmol/mol]), and had gained on average 7.1 kg while on insulin treatment. Most were white, except for one who was of Asian origin. Body weight had decreased by 4.5 ± 0.5 kg after 26 weeks of treatment with liraglutide and increased by 0.9 ± 0.6 kg with standard therapy (maximum likelihood mean difference −5.2 kg [95% CI −6.7, −3.6 kg]; p < 0.001) (Fig. 2), corresponding to −4.8 ± 0.5 vs +1.0 ± 0.5 percentage change in body weight, and between-group difference in BMI of −1.7 ± 0.3 kg/m2. Patients in the liraglutide group lost on average 81.3% of insulin-associated weight gain; 10 participants (38.5%) even showed complete reversal of weight gain, compared with none of the patients in the standard therapy group. Baseline factors associated with weight loss were being female, high insulin dose and lower BMI, while, during follow-up, the decrease in HbA1c was closely related to weight loss (data not shown). After 26 weeks, waist and hip circumference decreased by 2.1 and 1.5 cm, respectively, in the liraglutide group and increased by 2.7 and 3.0 cm, respectively, in the standard therapy group (p < 0.05 for both comparisons) (Table 2). 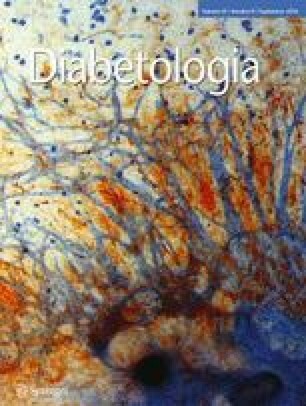 Glycaemic control, reflected by the change in HbA1c, decreased by 0.77 ± 0.11% (8.4 ± 1.2 mmol/mol) with liraglutide and increased by 0.01 ± 0.12% (0.1 ± 1.3 mmol/mol) with standard therapy (maximum likelihood mean difference −0.74% [−8.1 mmol/mol] ([95% CI −1.08%, −0.41%] [−11.8, −4.5 mmol/mol]); p < 0.001) (Fig. 2). Nineteen (73%) participants in the liraglutide group and seven (29%) in the standard therapy group reached an HbA1c value of 7.0% (53 mmol/mol) or less (p = 0.004). The insulin dose was reduced by 29 ± 3 U/day (−55.7 ± 4.1%) with liraglutide and increased by 5 ± 3 U/day (+11.8 ± 4.4%) with insulin (maximum likelihood mean difference −33 U/day [95% CI −41, −25 U/day]; p < 0.001) (Fig. 2), corresponding to −0.29 ± 0.03 U/kg and +0.04 ± 0.03 U/kg, respectively. Five participants (19%) in the liraglutide group were able to discontinue insulin therapy. This subgroup had a baseline BMI of 29 ± 5 kg/m2, weight reduction after 26 weeks of −3.8 ± 0.8 kg, an HbA1c reduction of −0.4 ± 0.3% (−4.4 ± 3.3 mmol/mol), and a relatively low insulin dose at baseline (four of them were treated with 20–24 U/day, one was treated with 84 U/day). No statistically significant changes in blood pressure and heart rate occurred in either group (Table 2). Liraglutide-treated patients often reported adverse gastrointestinal events, mostly decreased appetite (92.3%), dyspepsia (76.9%), constipation (53.8%) and nausea (42.3%) (Table 3). Although common, adverse events were mostly mild-to-moderate in severity and typically resolved after the first 4–8 weeks; at 26 weeks, only nine (35%) liraglutide-treated patients reported any gastrointestinal complaints, the majority of mild severity. In two participants, diarrhoea resolved after metformin was discontinued. No serious adverse events were reported. No change in liver or renal function occurred. Of the 26 participants treated with liraglutide, three (11.5%) were on a dose of 1.2 mg. The overall rate of hypoglycaemia was similar across treatment groups (Table 3). Minor (grade 1, 2) hypoglycaemia rates were 3.85 and 2.70 events per participant per year for the liraglutide and standard therapy group, respectively. No major (grade 3) hypoglycaemic events occurred. There were no changes in average total energy expenditure and physical activity (as reflected by steps per day and average METS per day) or quality of life (as reflected by the BDI-II and PAID questionnaires), neither among nor between the two groups during treatment (Table 2). Our study shows that addition of the GLP-1 analogue, liraglutide, to patients with pronounced insulin-induced weight gain results in a substantial reversal of weight, while glucose control is maintained or even improved. These findings suggest that adding liraglutide to insulin treatment is a valuable treatment strategy for these patients, for whom other methods to lose weight are difficult to implement, whereas continuation and intensification of insulin therapy leads to further weight gain. Some previous studies, mostly observational, have investigated the effect of adding GLP-1 analogues to existing insulin treatment in patients with type 2 diabetes [16, 17, 18, 19, 20, 21, 22, 23, 24, 25, 26, 27, 28, 29, 30, 31]. Our study differs from previous randomised controlled trials (RCTs) in that this is the first RCT where liraglutide was added to reverse weight gain in fairly well controlled patients, while all other trials added GLP-1 analogues to improve glycaemic control, and reported results on body weight as secondary outcomes, showing mixed results [16, 17, 19, 23, 25, 26, 27]. Furthermore, we compared two clinically relevant treatment strategies for handling insulin-induced weight gain, a therapeutic challenge often faced by clinicians, which no RCT has ever addressed. The 5.4 kg weight difference we found between addition of liraglutide and continuation of insulin is far greater than reported earlier in RCTs on the combination of GLP-1 analogues and insulin, where average weight loss after 26 weeks did not exceed 2.8 kg [17, 23, 25, 26, 27]. Only one recently published trial, by Lane and colleagues, found a 5.3 kg weight loss after 24 weeks in 21 extremely obese (BMI 39.6 kg/m2) patients with insulin-resistant type 2 diabetes . The larger weight loss observed in the present study may be explained first by the fact that it was not designed with the intention to improve glycaemic control, as improvement in glycaemic control is usually associated with weight gain [5, 8]. Second, liraglutide-induced insulin dose reductions were greater in our study than in others [17, 19, 23, 25, 26, 27], and the decrease in insulin dose was also a predictor of weight loss. Finally, patients in our study were selected for pronounced insulin-associated weight gain. Interestingly, the amount of insulin-induced weight gain was not significantly related to the amount of liraglutide-induced weight loss. In contrast with the registration trials [10, 11, 12, 13, 14], weight loss with liraglutide was inversely related to BMI, with the greatest weight loss occurring in patients with a lower rather than a higher BMI. Although not intended, HbA1c fell by 0.77% (8.4 mmol/mol) after 26 weeks, which is a known effect of liraglutide and within the range of reductions observed in most previous RCTs on insulin-GLP-1 analogue combinations [19, 23, 25, 26, 27]. The two treatment groups showed numerical differences in smoking and drinking habits, which may be relevant, as smoking is known to influence insulin resistance. However, these differences were not statistically significantly different, and, with linear regression analyses, we found no relationship between smoking and drinking habits and HbA1c reduction and weight loss. In our study, one in five patients could completely discontinue insulin. As glycaemic control in most patients improved beyond target, one may speculate that more aggressive down-titration of insulin might have resulted in even more weight loss and a larger proportion of patients being able to discontinue insulin treatment. As expected, adverse gastrointestinal events associated with liraglutide occurred in the first 4–8 weeks of treatment and mostly concerned loss of appetite, dyspepsia and constipation rather than vomiting and diarrhoea, as often reported . Neither the presence nor the severity of these events was related to the magnitude of weight loss or HbA1c reduction. The withdrawal rate due to adverse events was much lower in our study than in others [17, 24, 27], possibly because we monitored patients every 4–6 weeks and allowed them to remain on a lower liraglutide dose when needed. This could also have prevented a higher rate of hypoglycaemia in the liraglutide-treated group, the absence of which has been described previously [17, 19, 22, 23, 25]. The use of sulfonylurea was similar in the two groups, and sulfonylurea did not explain changes in body weight or occurrence of hypoglycaemia in linear regression analysis. Our study has limitations. First, only patients with pronounced insulin-induced weight gain in the first 16 months of insulin therapy were included and therefore we cannot vouch for the efficacy of liraglutide in patients with less pronounced weight gain or weight gain on long-term insulin treatment. We defined 4% weight gain as pronounced, as this reflects the upper 50% of insulin-associated weight gain and a minimal weight reduction of 3–5% in obese participants is already associated with a clinically relevant reduction in health risk [6, 36, 37]. Second, as our study duration was 26 weeks, it cannot determine whether the effects of addition of liraglutide to insulin are sustained after this time period. Our study included only 50 patients, and, although intended, it was not placebo controlled, which could be viewed as a limitation. The open study design may have caused unintended differences in compliance with dietary advice between the treatment groups, although the similar physical activity scores suggest such an effect to be minimal at the most. Next, the three additional telephone consultations in the first 4 study weeks for liraglutide-treated patients may have added to the effect of the liraglutide intervention. These consultations were appointed for safety reasons only and were not scheduled in the group receiving standard therapy, because they were less likely to experience hypoglycaemia and treatment-related adverse events. Furthermore, as two different treatment strategies were compared, these consultations are not part of a regular insulin-treatment strategy. Nevertheless, the comparison of two different, clinically relevant, treatment strategies is just the strength of the study. Currently, the most practised approach for patients with insulin-associated weight gain is continuation and intensification of insulin treatment. A further strength of this investigator-initiated study is that it reflects real-world clinical practice and permitted various insulin regimens and oral glucose-lowering agents. In current clinical practice, insulin therapy is still the cornerstone of type 2 diabetes therapy. Most patients will reach a good or at least fair HbA1c level with insulin but, in some patients, at the expense of significant weight gain. According to clinical practice guidelines, addition of a GLP-1 analogue is not indicated in this situation . We show, however, that the addition of liraglutide in patients with pronounced weight gain was effective in reversing weight gain, allowed one in five patients to discontinue insulin treatment completely, and reduced insulin need in most others, while glycaemic control further improved. Nevertheless, not all patients responded to the therapy. In fact, the effects of the therapy were clear within 12–16 weeks and indicative already after 8 weeks. Hence, a 3 month trial period may be a suitable approach to test the weight and HbA1c-reducing potential of liraglutide in individual patients with pronounced insulin-associated weight gain. In those that show no response within this time frame, the treatment could be discontinued. Further studies are needed to assess whether such an approach within the modern concept of personalised, patient-centred healthcare is cost-effective. Our trial contributes to future debates on these matters. We wish to thank the study participants. We also thank P. van de Ven, S. Hendriks, L. Zimmerman (diabetes nurses at Radboud University Medical Centre, Nijmegen, the Netherlands) and A. Ek and J. Balk (diabetes nurses at Jeroen Bosch Hospital, ‘s-Hertogenbosch, the Netherlands) for conducting some of the outpatient visits. This is an investigator-initiated trial, which was funded by Novo Nordisk, Alphen aan den Rijn, the Netherlands. Novo Nordisk also provided the medication. Novo Nordisk was not involved in the design of the study, the collection, management, analysis and interpretation of the data, the writing of the report, or the decision to submit the paper for publication. CT received research grants, served as a consultant for, or gave lectures organised by, Merck, Janssen, AstraZeneca, Novartis and Novo Nordisk. All other authors declare that there is no duality of interest associated with their contribution to this manuscript. GMMV, HJJ, BEdG and CJT designed the study. HMdW, GMMV, HJJ and WJCdG acquired data. HMdW and GMMV analysed and interpreted the data. HMdW, CJT, GMMV and BEdG drafted the manuscript. All authors revised the manuscript for critical intellectual content and approved the final version of the manuscript. CJT obtained funding. CJT is the guarantor of this work and, as such, had full access to all of the data in the study and takes responsibility for the integrity of the data and accuracy of the data analysis.